-The ultimate protection for fibreglass, metal & painted surfaces. -UV inhibitors help stop fading and oxidation. -For medium to heavy oxidation, use Premium Cleaner Wax. -Maximum UV Protection & Shine. -PTEF® is the slickest, non-stick material ever developed - it repels water and oil based stains and deposits, making future cleanup quick and easy. -Specially formulated for use on fiberglass, metal, plexiglass and painted surfaces and can be applied over old wax or polish. -Lasts up to 4 to 5 times longer than other marine waxes. 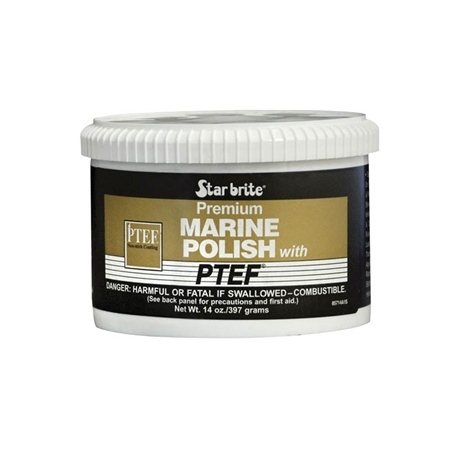 -"PTEF® is Star brite's registered trademark name for polytetraflouroethylene.